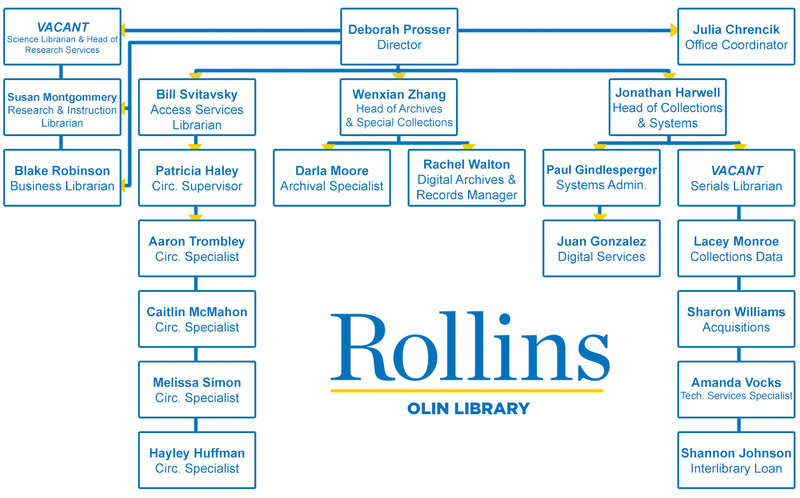 The mission of the Olin Library is to provide exceptional services, information resources, and a welcoming environment for the Rollins community. We support the academic pursuits of Rollins College and are committed to providing collections, services, space, and expertise that meet the needs of our community. The library’s collection provides access to print, digital and archival materials. These materials are vital to the creation of new knowledge on our campus. With that knowledge, members of the Rollins community develop an awareness of responsible leadership in today’s society. The information services provided by Olin Library gives our users the opportunity to explore a variety of perspectives cultivating them into global citizens. The library space provides students, faculty, and staff the opportunity to engage with each other, or work individually. In this space, members of the Rollins community engage in dialogue or thoughtful reflection on their perspective of the world and their place in it. Librarians instruct students in accessing various information formats, evaluating the authority of these resources, and navigating the digital world as they approach their research and make efforts to live meaningful lives and pursue productive careers. The Library Advisory Council consists of a balanced representation of faculty from different Rollins departments. The council's role is to advise the library director on library services, resources, and facilities, and to represent the faculty in library decision making. It also seeks feedback and communicates with the faculty regarding library services, resources and facilities. Council meetings occur once per semester, or as needed. LibQual ﻿is an international web-based survey conducted by the library to determine the expectations of patrons and their level of satisfaction with the services that the library provides. Results of previous surveys are available below. R2 Consulting's Report on Rollins Technical Services - In spring 2008, R2 analyzed the selection-to-access workflows at the Olin Library. The overall goal of the project was to prepare for the future of library services at Rollins. The library is currently considering which recommendations to implement and how. Please note that some of the above pages and documents are not up to date, and may contain references to faculty and staff members who are no longer at Rollins. ﻿Rethinking the Writing and Tutoring Center should happen as part of broader, strategic thinking at the institutional level. Support for both teaching and learning at the college should be approached strategically, based on clearly identified needs, and targeted to meet those needs.